Quality manufactured synthetic stone veneer products are just as durable as natural stone for outdoor hardscape projects. In addition to being durable, veneer stone is much faster and easier to install than natural stone. We also offer brick veneers and stone wall coverings. 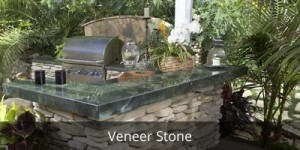 ask our Decorative Concrete Specialist about veneer stone and the supplies needed for a hardscape project. Contact Sealant Depot to order veneer stone supplies.